How high is App Engagement during Super Bowl? It’s time for the big game. Will defense win the championship or will the offensive miracle prevail? This Sunday, the eyes of the sports world face towards Atlanta, Georgia, USA – where the final game of the football season in the NFL takes place. But what does this event mean for mobile usage? How high is the app engagement during Super Bowl? And what can you learn from these facts as a mobile marketer? A survey by AdColony, recently published via Mobile Marketer, found that football fans are less likely to use mobile apps during the game. 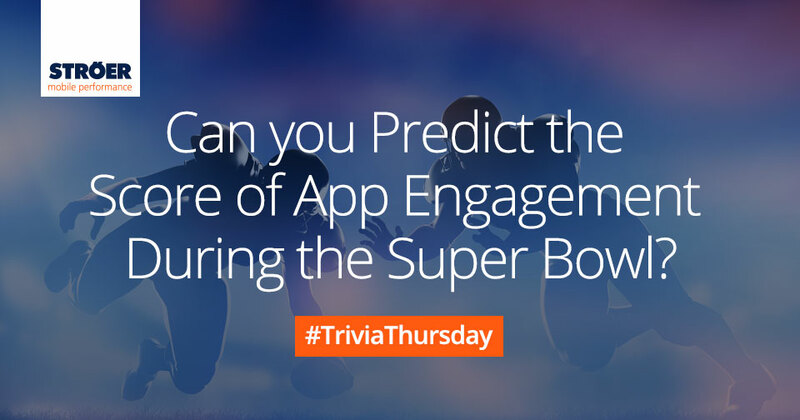 14 per cent is the score of app engagement during the Super Bowl. That is, 14 per cent of football fans will engange with apps during the game. In a more general consumer base, 39 per cent interact with apps. Meet us at Mobile Growth Summit in San Francisco! The smartphone doesn’t yet play a relevant role in watching the clash of the year. Only 7 per cent are watching it via a smartphone application. The research delivers arguments pro classic tv advertising while a cautious approach for smartphone campaigns during the game should be considered. Urban Airship, however, sees a lot of opportunity to score with smartphone-enabled consumers during the game. And so they offer a blog post with advice on how to engage audiences during Super Bowl. Urban Airship offers data to consider when deciding on app promotion in the game’s context. For instance, app usage rises by 10 per cent during the pre-show. Urban Airship’s data back up the findings mentioned above. For instance, the low points of app engagement are hit during the game itself. This applies especially to the first quarter and in the second half of the game. What’s the impact of emojis in mobile marketing? Find out!